Homemade coleslaw makes a tasty way of enjoying a variety of crunchy raw vegetables - use as a side dish or a filling for jacket potatoes or sandwiches. 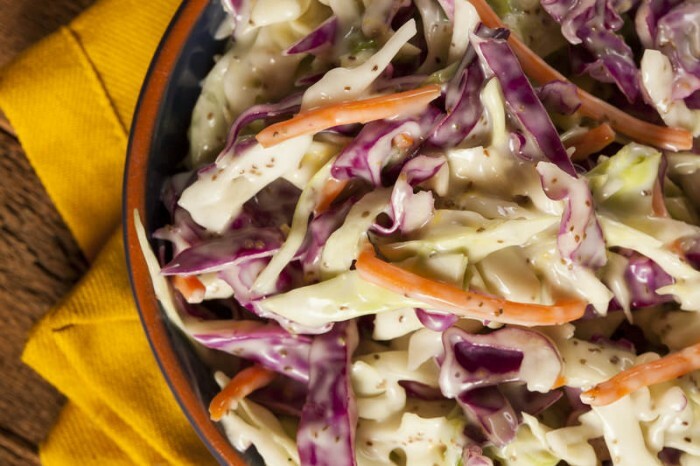 Shop bought coleslaw tends to be light on vegetables and heavy on fat-laden mayonnaise. This recipe uses yogurt to give a lighter, healthier variation. 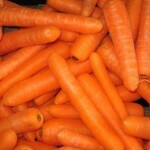 And just one 80g serving provides one of your 5-a-day! Follow a recipe; follow food safety & hygiene rules; use measuring spoons and cups; chop using the bridge/claw safely; use a vegetable peeler safely; use a box grater safely; tidy away. Chopping board, vegetable peeler, sharp knife, box grater, bowl, spoon. Peel the onion and cut off the ends. Grate the onion, carrots and cabbage. N.B. You can store coleslaw in the fridge in a covered container for up to 3 days. Vegetables are so good for us! Low in fat, sugar and calories and packed with vitamins and minerals. Cabbage, carrots and onion are all fabulous healthy vegetables, and because in this recipe they’re served raw you don’t lose any of the healthy stuff in cooking! 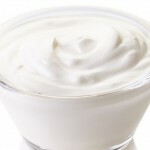 Yogurt is an excellent source of calcium, and a good source of Vitamin D for strong teeth and bones. It is also a good source of protein.